I’m 18 and I’m stuck in between coats. I’m 5’6 and I’m about 140 lbs. 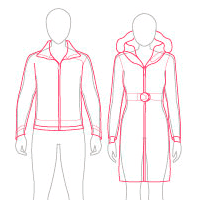 I was wondering if I should get the Rundle bomber in an XL in youth or the trillium coat in women’s in a medium. I just want enough space so that I can fit a hoodie underneath. I haven’t been able to try either on but if I’m able to fit the XL in youth then I’d prefer the Rundle bomber coat. I’m just not sure of the sizing. Hello Brit, the best I can suggest is to refer to the measurements in the size charts. These are going to be the most accurate for you. 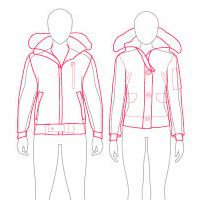 Both coats have a regular fit so should be more or less similar for that but while looking at measurements, keep in mind the measurements if you wish to be able to fit a hoodie underneath; if the measurement is 33½-35½ and you’re closer to the 35, you may want to size up to allow space for comfort if you were to add a layer. Hello Heather, it is hard to say as everybody has a different body shape. It’s more of a thigh-length jacket so it should be fine. The best I would suggest is to try it on and if you aren’t happy you can return it. If you’re a lifetime member and living in Canada, you do get free shipping on returns. I am looking for 3/4 length Canada goose coat that’s loose so if needed I can put on layers if needed. I usually get XL, which coat do you recommend? Hello Rebeca, the only relaxed fit Canada Goose parkas are the big bulky ones like the Expedition and the Resolute. If you were to go with a regular fitting parka and size up, that should be fine. Always refer to the measurements in the size chart as that will be the most accurate. As for styles, you could try to Trillium or the Rowan. The Rowan has a belt at the waist and offers a little more shape compared to the Trillium. Hi I’m trying to decide on a size in the ladies camp hoody as some reviews say fits small although the sizing chart says I will fit a large. I am 5’8″ 189 lbs my measurements are 38-33-42. Can you explain the best size for me in either the camp hoody or the brookvale? Hello Deanna, as your measurements are more near the beginning of the measurements for the size, I think a large would be alright for you although if you prefer a more relaxed fit, I would suggest going a size up. In either case, you can order both to try them on and see which is best then return the other. Hi I’m interested In purchasing either the brookvale or the camp hoody shorter jacket in ladies. I am unsure which size to order I’m 5’8″ and 187lbs my measurements are 38-32-42 should I be ordering the large or xl? Which would be a slimmer fit of the two with less bulk and without being too tight? Also which would fit longer? Hello Dennae, both jackets have a very similar fit as they are both slim so it will be a matter if you prefer the slightly longer fit or not. As for sizing, you are right at the start of the measurement for the large so I think the large should be fine. If you prefer a more relaxed fit, the Xlarge would be your option. Hello! I am 6’1″ female apps. 175 lbs. Normally wear size 8. I I have about a 6’5″ wingspan…. Yes, I played volleyball. I have tried on the Women’s Canada Goose in Trillium (M/L) and I love the warmth and durabilty and aesthetic of that coat. However, the arms are still quite not long enough, and I don’t want to keep going up sizes when the arm length is the issue, not the overall fit. I get that flying squirrel look where the length of the coat does not go all the way up my torso to my armpits. Is there a coat similar to the aesthetic of the Trillium that you could recommend that would be good for my height/arm length? Is there a more stylish Men’s coat that would better fit my arms? Appreciate the feedback. Hello Gabrielle, the Canada Goose jackets are all quite uniform and the parkas will have more or less the same length of sleeves. 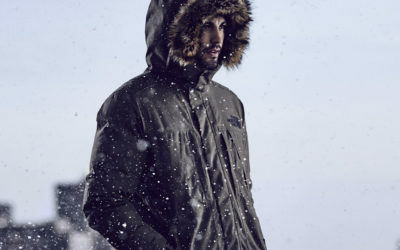 You may be better off choosing from another brand likes the Merideth Down Parka from Nobis or the Fogo Down Parka from Quartz Co. If you were to switch to a men’s model you could, but they will be less form fitting as they are designed for the male physique as opposed to that of a woman. I am interested in the men’s freestyle vest and I’m not sure which size would be best for me. M or L? I’m 5’8 170 and I don’t want a loose fit but I’d like room for an underlayer like a hoodie. Any advice would be appreciated. Hello Dave, for the most accurate answer I would suggest referring to the measurements in the size char ton the product page. This will give you a better idea of how the vest will fit. I suggest wearing a base layer top that you would plan to wear under the vest and take your measurements with that.